Above. 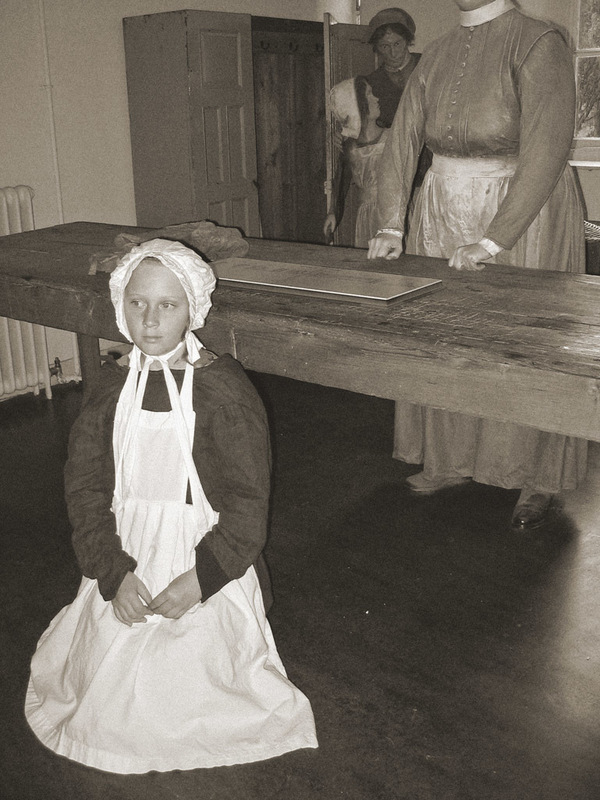 One of my daughters posing in workhouse pauper attire, in the very workhouse that some of her own ancestors lived. Gressenhall Rural-Life Museum, Norfolk. Here I will attempt to list as many of my 4 x great grandmothers, who they were, where they lived, and something about them. Elizabeth Brooker (nee Seymore). b.1797 Drayton, Oxon. England. Mother to seven children. Wife of an agricultural labourer. Hannah Edney (nee Hedges) b. 1784 Enstone, Oxon, England. Wife of a thatcher. Brickwall. Switzerland. Wife of a copper smith. Susannah Durran (nee Waine) b. 1809 Tadmarton, Oxon, England. Wife of a tailor, mother of seven. Anne Bennett (nee Neale). b. 1786 Norfolk, England. Farmer's wife. Frances Baxter (nee Shilling). b. 1778 Gressenhall, Norfolk, England. Bricklayer's wife and mother of four. Mary Barker (nee Bligh). b. 1797 Scarning, Norfolk, England. A shoe maker's wife. Jemima Barber (nee Harris). b. 1800 Swanton Morley, Norfolk, England, an agricultural labourer's wife, and mother of eight. Mary Smith (nee Smith). b. 1775 Attleborough, Norfolk, England. An agricultural labourer's wife, and mother of seven. Elizabeth Hewitt (nee Freeman). b. 1779 Attleborough, Norfolk, England. An agricultural labourer's wife, and mother of five children. Ann Peach (nee ?) b. 1779. Northants, England. Wife of a Shepherd, mother of four. Elizabeth Riches (nee Snelling) b.1781 Banham, Norfolk, England. Wife of an agricultural labourer, mother of nine children. Elizabeth Barber (nee ?) Lived at Halesworth, Suffolk, England. Elizabeth Beckett (nee ?) b.1770. Lived at Tasburgh, Norfolk, England. Wife of an agricultural labourer, mother of seven. Frances Gooderham (nee ?) b.1790 Saham Toney, Norfolk, England. Wife of an agricultural labourer, mother of eight. Mary Ann Curtis (nee Rose) b.1806 Buckenham Ferry, Norfolk, England. Wife of a marshman and agricultural labourer, mother of nine. Elizabeth Larke (nee Dingle) b.1795 Strumpshaw, Norfolk, England. Wife of an agricultural labourer. Only two children found. Elizabeth Rose (nee Brooks) b.1806 Postwick, Norfolk, England. Wife of agricultural labourer, mother of nine. Hopeful Barker (nee Morrison) b.1804 Lingwood, Norfolk, England. Wife of an agricultural labourer, mother of eight. Susanna Key (nee Briggs) b.1781 Strumpshaw, Norfolk, England. Wife of an agricultural labourer, mother of four. Elizabeth Waters (nee Ransby) b.1772 Freethorpe, Norfolk, England. Wife of a mole catcher, mother of four. Judith Goffen (nee Shepherd) b.1772 Reedham, Norfolk, England. Wife of a carpenter, mother of six. Emily Nichols (nee Beck) b. 1795 Halvergate, Norfolk, England. Wife of an agricultural labourer, mother of only two known. Elizabeth Tovell (nee Smith) b.1795 Toft Monks, Norfolk, England. Wife of an agricultural labourer, mother of six. Ann Tammas (nee Dove) b.1786 Norfolk, England. Wife of an agricultural labourer, mother of five. Ann Lawn (nee Porter) b.1763 Limpenhoe, Norfolk, England. Wife of an agricultural labourer, mother of four. Mary Springall (nee Wymer) b.1789 Mouton St Mary, Norfolk, England. Wife of an agricultural labourer, mother of seven. Catharine Thacker (nee Hagon) b.1797 Shipdham, Norfolk, England. Wife of an agricultural labourer, mother of three (died 1832, husband remarried). Sarah Daynes (nee ?) b.1783 Witchingham, Norfolk, England. Wife of an agricultural labourer, mother of ten. What I will also say, is that these ancestors could have had more children, that I have not found baptism records for. Also, that in addition to looking after the household, and rearing so many children, they would have to contribute to income whenever they could, be it by laundering for others, tailoring, and seasonal casual work on the fields.